Monster Energy congratulates Jamie Anderson on her win at the US Grand Prix at Mammoth Mountain on Saturday. The Contest Veteran Overcame Challenging Conditions to Win the Last Olympic Qualifier of the Season Solidifying Her Spot on Team USA. 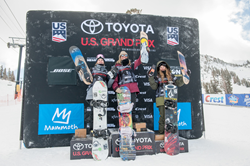 Monster Energy congratulates Jamie Anderson on her win at the US Grand Prix at Mammoth Mountain on Saturday. Adding another victory to her trophy chest as women’s slopestyle all-time winningest snowboarder, Anderson cruised to victory as Olympic hopefuls gunned it out under stormy skies and snowy slopes. Though some may have seen today’s victory as just another Grand Prix win for Anderson, whose hall of fame resume reads far beyond her youthful 27 years, it was in fact as significant as any win in her career, providing the all important momentum needed to sustain her dominance in this critical Olympic season. While many of the women were having trouble keeping speed through the course due to heavy snowfall that accumulated in past days, Anderson who has been competing at this level for over a decade used her experience as much as anything to take the win. Early on it was apparent that any washed landing or slip-up would make clearing the jumps at the bottom of the course difficult, if not impossible. With that, Anderson understood it would not be her most progressive run that proved effective, but her cleanest. Going easy up top with a stylish backside lip-slide followed by a clean front board down the kinked rail, she then pumped for speed as she cleaned up the upper rail section with an awesome frontside boardslide-to-270-off as she floated 20-plus feet down the transition. Contrary to most other riders, at this point Anderson had only gained more speed for the impending final jumps and in turn popped a backside 180 of a unique side-hit feature setting her up switch for a flawless cab 540 underflip. With such a clean landing she again pumped for speed, flattened her base and sent a huge frontside 360 deep into the landing of the final hit. Holding her heart and hardly containing her elation one could sense that this run would not be topped as Anderson unstrapped in the corral at the bottom of the course. Normally this is not a run that would win a major contest like the Gand Prix, but snowboarding is all about adaptation and it’s the opinion of many that the mark of truly great rider is one who excels in all conditions — not just perfect ones. Awarded a score of 84.10, Anderson took the win with ease as most riders failed to land a solid run at all. Though Anderson had enough tour points to unofficially make the team weeks ago, today the announcement was made official by the US Olympic Committee: Jamie Anderson will represent the United States at the XXIII Winter Olympic Games in Pyeongchang, South Korea February 9th - 25th, 2018. With the world watching, will Anderson defend her gold medal win in 2014 in Sochi, Russia in the inaugural women’s snowboarding slopestyle event? For more on Anderson and the rest of the Monster Energy snowboard team visit http://www.monsterenergy.com, and follow Monster Energy on Facebook and Instagram.